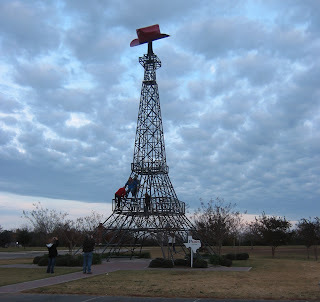 ...in Paris, Texas! It was cold, so I did not climb it. I actually do not know the people in the photo. We made a quick stop to check out this site, so I just snapped a few photos. This tower is 65 feet tall and was built in 1995 (with the cowboy hat added in 1998). I need to make a correction to my earlier post about Paris, Texas. The second largest Eiffel Tower is now in Las Vegas. We had a great Thanksgiving road trip to Paris. We did not hit bad traffic considering that it was a holiday weekend. (John drove and I navigated.) We had the chance to catch up with John's family. I was able to meet some more of John's family for the first time. Greg and Cindy fed us very well and were great hosts.